One of the most important aspects to prepare when you are getting married is the wedding centrepieces. These are embellishments decorated on tables where family, friends and guests stay during the reception part. It is very important to have a very decorative and beautiful wedding table. Centrepieces can surely make that happen which may be in various forms. These include flowers, vases, candles and other matching items. They alone can improve the overall design of the reception hall and boost the ambiance to make the event more meaningful. Having said that, you must choose great centerpieces to add to each table of your wedding to make it a lot more unforgettable and unique. There are various wedding centrepieces ideas that you can get from the Internet and magazines. Wedding planners are also a great source of what style to choose to enhance your wedding table. However, you can make your own centrepieces in order to save money. Here are series of great ideas to consider if you want to make your own table centerpieces for your wedding. First of all, make a plan ahead of time with your partner. You discuss the things you like to add to your wedding tables. This is how you can manage to determine what kind of style and which items to display. The first things that you have in mind are certainly the kinds of flowers to use and the colors to select. Generally, anything you put onto your wedding table centerpieces must be paired with your wedding theme. Simplicity and elegance are great combination to make your wedding centrepieces look really remarkable. Do not over decorate your tables as they may become less stunning. A few sticks of flowers or a small bouquet are enough to enhance wedding tables. You just add some ornaments to make the decoration more unique. 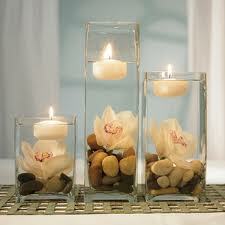 It is also a traditional concept to add fragrance by the use of scented candles. Three to five candles can give sufficient aroma. This is actually common but the way you design your table and the choice of styles can make your concept a lot more creative. Flowers are always the main centrepieces for wedding tables. This concept may sound very easy but there is an important to remember when choosing flowers. First, you must identify the flowers to choose because some are seasonal and may not be in demand during your wedding day. Thus, you choose flowers that generally bloom during the date of your wedding. It is easier to make an order in this case. Wedding centrepieces do not have to be very expensive. You can make some cheap wedding centerpieces by using recyclable stuffs like seashells with sand in a stylish bottle or several rose petals. Just use your own creativity in designing your wedding tables. There is no need to be fancy and extravagant. As long as your wedding tables are designed properly and beautifully, the cost does not really matter at all. Keep in mind to create wedding tables with centerpieces that can surely compliment your wedding theme. For additional concept on how to design your wedding tables with centerpieces, browse the Internet or scan some pages of wedding magazines. It is recommended that you have some ideas where you can get help from to assist you in creating an original design to make wonderful centrepieces. If you are able to enhance your wedding centrepieces, your own wedding speech is much easier in that case. Thus, you read a few samples of wedding speeches and toasts as well as writing tips to help you polish an original wedding speech. It’s really nice and useful information. I’m glad that you shared this helpful info with us. Please stay us informed like this. Thank you for sharing. I would like to look extra posts like this and last but not the least please tell us how to arrange Wedding Centrepieces.I really appreciate it because it’s all what I need.